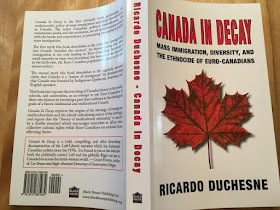 that the theory of multiculturalism is bedevilled by a double standard in promoting the collective right of minorities to affirm themselves as members of ethno-cultural groups while insisting that Euro-Canadians who speak as members of an ethno-collective group are racist. They could not explain why it is illiberal to criticize diversity but it is liberal to prohibit criticism of diversity. They could not explain why Canada is uniquely multicultural when almost every other Western nation has embraced this same ideology. This is why they censored these interviews. Despite relying entirely on guerrilla marketing, Canada in Decay was the most sold book on politics on amazon.ca in early March 2018. It is still ranking second as of today. 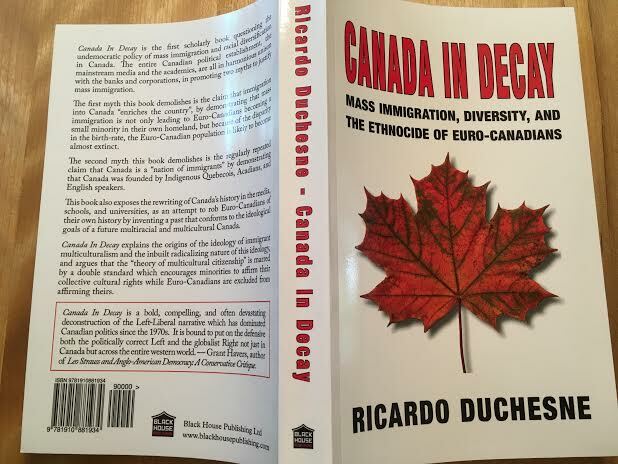 Once you read the book, I also encourage you to write a short review at Amazon.ca, if you agree with the arguments. This is very important. It is a key way to counter the anti-White establishment and its efforts to ignore and malign this book. Academics and fake journalists are furious this book is a best seller, let's keep them angry for a long time!